MODIFIED TEAMS: WANT $5,000?! WELL, COME & GET IT at THIS Saturday's $5,000 to win...the LONESTAR OUTLAW MODIFIED CHAMPIONSHIPS presented by Smiley's Racing Products and P&W Sales, June 9 at 8pm! -NO driver entry fee! -NO draw fee! -NO series license! -OPEN PRACTICE NIGHT just added: FRI. 6/8 7-10pm $15 all pit passes. -A-feature 30 laps:$5,000-2,000-1,000.... then payback goes down til it gets to $200/start. -all NQ’s still get paid! $50. -Passing points in heats, straight up feature lineup! -No mufflers required (in any division). 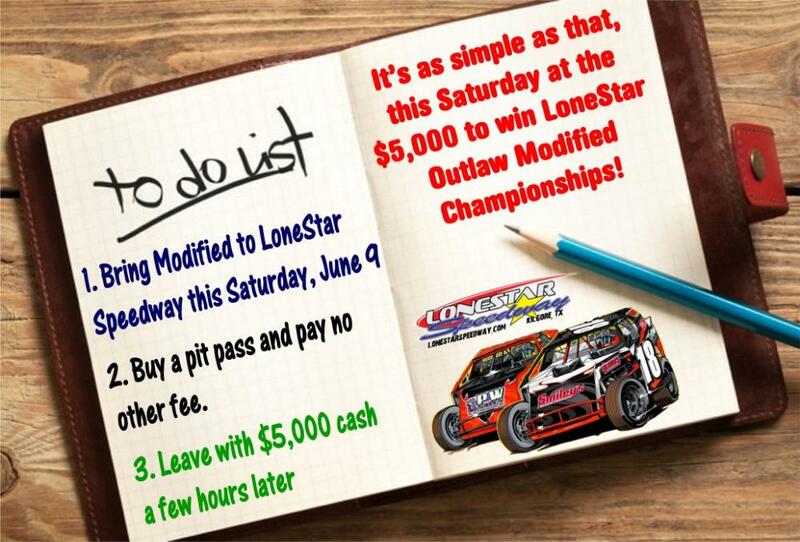 $5,000 to win LONESTAR OUTLAW MODIFIED CHAMPIONSHIPS – SAT. JUNE 9th! Kilgore, TX (06/04/18) by DarinShort.com. Years of fan base and race team building at LoneStar Speedway have led us to this point in time: the ability to put on a huge, HUGE one-night, no entry fee event for the big LoneStar Modifieds. The LoneStar Outlaw Modified Championships will bring in the best Modified teams for one night to battle it out for a dizzying $5,000 cash to the winner at the end of the 30-lapper - at LoneStar Speedway THIS SATURDAY NIGHT, June 9th, 8pm! It’s going to be a great payday for a lot of teams, as the event pays $2,000 to second place and $1,000 for third; and will pay all starters a minimum of $200. Plus, there’s no entry fee, draw fee or license fee due either. This will be a full points event for all divisions, and all Modified teams that enter will receive 50 bonus points in addition to whatever regular points they earn that night. There will be passing points awarded in the Modified division, and the feature race will be lined straight up by points. This Saturday June 9th marks the second ‘LoneStar Speedway Championship’ of 2018, which are four individual nights that feature a LSS division racing for big money and the championship title. On Sunday May 27th the Front Wheel Drive 4-Cylinder LoneStar Championship was held, and it brought in several new drivers from across the region. We expect the Modified Championships to be no different. August 18th - $1,500/win LoneStar Factory Stock Championships…details at the track website. BACK TO THIS SATURDAY JUNE 9th…you and the family will be able to take in this massive event for just $17 adult (ages 12-64) general admission! Ages 6-11 are just $5, while Seniors/Military GA pricing is $15. All pit passes for all ages are $35. Any grandstand ticket can be upgraded to the Reserved Section with bucket seats for $5 per ticket. MODIFIED CHAMPIONSHIPS FEATURE PAYBACK: $5,000 - $2,000 - $1,000 - $700 - $500 - $400 - $300 - $280 - $260 - $240 (10th) - $220 - $200...to 20th. All Modified NQ's or Non-Starters $50. Transponders and RACEceivers are required. LoneStar FWD 4-Cylinder Championships: $200 - $150 - $120 - $110 - $100 - $90 - $80 - $70 - $60 - $50...to 20th. RACEceivers required. No outside food/drink allowed through ticket gate. Great food and drinks available at family-affordable pricing, for example, bottled water and soft drinks are available starting at $1.50. Adult beverages for sale next to main concession stand. Grandstand admission: Ages 5 and under are free (with adult admission), Ages 6-11 are just $5, and Ages 12-64 are $17. Seniors/Military $15. You can upgrade any grandstand admission ticket to the reserved section (bucket seats) for $5/ticket upon your entrance to the reserved section. All Pit Passes all ages are $35. The popular LoneStar ‘Family Pack’ of tickets is available for this event and is $34. It includes two adult GA tickets, plus up to four kids (ages 11 and under) for free – a savings of up to $20! CLICK www.LoneStarSpeedway.com for all track info and visit us on Facebook at LoneStar Speedway. Mark your calendars now and make plans to join us THIS SATURDAY June 9th for one of the biggest 1-day dirt track paydays around…the $5,000 to win LoneStar Outlaw Modified Championships! *TONIGHT* it's the HUGE $5,000 to win LONESTAR OUTLAW MODIFIED CHAMPIONSHIPS Everyone Has Been Waiting For! NO driver entry fee! NO draw fee! NO series license! Track located at I-20 and Exit 583, then go north 1/2 mile to stoplight, turn right (east) and go 1 mile and track entrance is on the right. SOME OUTLAW MODIFIED DRIVER WILL BE LEAVING WITH $5,000...who's it going to be?!?! A local? Invader? We'll find out TONIGHT at LoneStar Speedway at 8pm! It's ANYONE'S Race! Will the winner be one of the tough 'local' LoneStar drivers? Will it be some invader swooping in and stealing the money?! We'll all find out TONIGHT at 8PM! -A-feature 30 laps:$5,000-2,000-1,000.... then payback goes down til it gets to $200/start. All NQ’s still get paid! $50. Kilgore, TX (06/09/18) by DarinShort.com. Years of fan base and race team building at LoneStar Speedway have led us to this point in time: the ability to put on a huge, HUGE one-night, no entry fee event for the big LoneStar Modifieds. 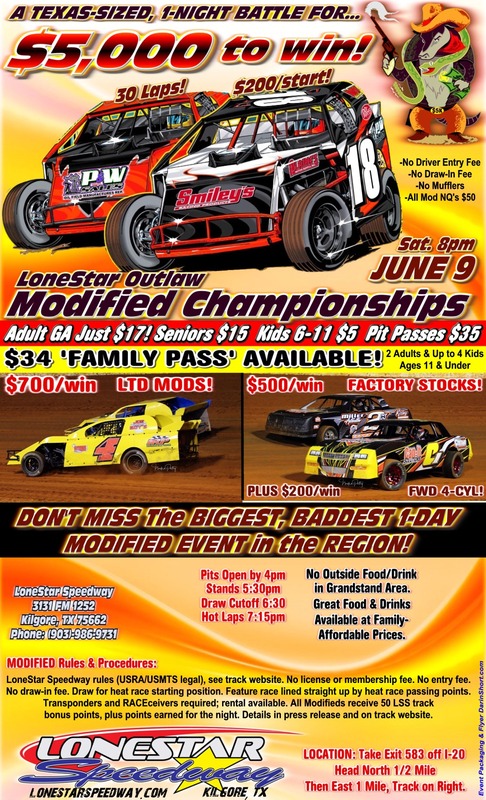 The LoneStar Outlaw Modified Championships will bring in the best Modified teams for one night to battle it out for a dizzying $5,000 cash to the winner at the end of the 30-lapper - at LoneStar Speedway *TONIGHT* SATURDAY NIGHT, June 9th, 8pm!